Pricing includes exclusive 15% discount on expedition, plus receive $150 Shipboard credit per traveller! Day 1 — Punta Arenas, ChileYour adventure begins in Punta Arenas, Chile, the most populated city in southern Patagonia. If you arrive early, there are many museums, restaurants and shops to keep you busy for days. By early afternoon, a Quark Expeditions representative will meet you at the official starting point hotel, where you’ll enjoy a welcome dinner and be briefed about preparing for your embarkation day. Day 2 — Embarkation DayYour charter flight from Punta Arenas to Antarctica will have you crossing the legendary Drake Passage in only a few hours. Far below, the ship will approach King George Island for your arrival. Your first glimpse of dramatic Antarctic landscapes will be from a unique perspective, as your plane descends for landing in the South Shetland Islands. After landing, stretch your legs and spend time exploring the island before being transferred by Zodiac to your ship to set sail for the Antarctic Peninsula! Days 3 to 6 — Antarctic Peninsula and South Shetland IslandsThere are few places in the world as evocative as Antarctica. As your ship approaches the White Continent, you may be overcome by feelings of excitement and awe. Much of Antarctica is indescribable and can only be fully appreciated through your own eyes.As your captain and Expedition Team keep a lookout for whales and seabirds, you’ll be alerted to any new sightings. Our team of expert lecturers will also provide in-depth explanations of the geology, history and wildlife of the region.Even more exciting are your daily land excursions. Your first Zodiac landing is something you’ll never forget! Walking up to a beach dotted with penguins and seals is the most intimate way to experience the unique wildlife of Antarctica.Each landing is different and is dependent on weather, but every day presents new sightings and photo opportunities, and it won’t be long before you can tell the difference between an Adélie, gentoo or chinstrap penguin.You may take a Zodiac cruise in search of whales and icebergs around Pleneau Island one day, followed by a hike to a penguin rookery the next day. From the booming sound of a calving glacier at Neko Harbour to the thrill of watching a leopard seal as it hunts a penguin, you’ll wake up early and welcome each day with a sense of excitement and a desire to explore that which is unrivaled by any other travel experience.Your Expedition Team will be with you all along the way, providing insights into the places you visit. Day 7 — Disembark and Fly to Punta ArenasAfter your week of exploration, you’ll say goodbye to your Expedition Team and disembark at King George Island. 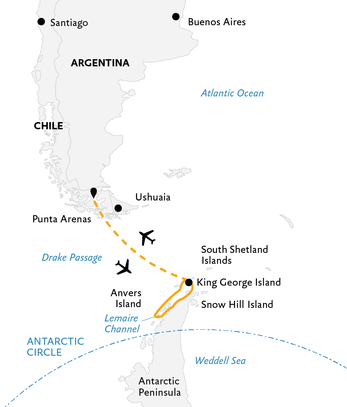 Your three-hour flight across the Drake Passage to Punta Arenas, Chile, brings your adventure to an end. After your transfer from the airport to the hotel, you are free to explore and enjoy one final dinner to reminisce about the sights and sounds of Antarctica. Day 8 — Depart Punta ArenasAfter breakfast, you are welcome to continue on your own travels or make your way to the Punta Arenas airport for your homeward flights.